#Badgers win a grinder after blazing early, 57-43. Six wins in a row. Wisconsin outrebounds Illinois 45-36, including 19-16 on the offensive glass. #Badgers hit the midway point of the B1G season at 8-1, tied with Maryland atop the conference. Indiana comes to Madison on Sunday. Illinois with just 43 points, fewest this season by far. Previous low was 56 vs Maryland. One of the more amazing stats: The last time Illinois scored more than 70 points vs. UW was Jan. 25, 2005. That's 25 games at 70 or below. 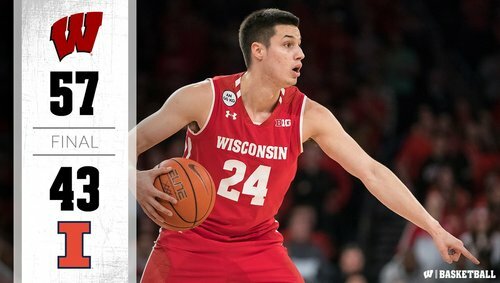 #Badgers Happ scored 32 of UW's 61 points vs. Rutgers. Tonight, Happ led EIGHT scorers with 14. #Badgers got great D/rebounding from Hayes. Thomas, Moesch and Trice combined for 4 pts and 8 boards. #Badgers Showalter hit huge 3 to push lead to 45-36 + stem Illini momentum. Hayes + Happ combined for final 12 pts. #Badgers have now won games this season when scoring in the 50s, 60s, 70s, 80s and 90s. First version of #Badgers story was filed courtside. Will tweet out link after interviews. Remember when #Badgers were 1-4 + 9-9 last season? Since then, UW is 19-3 in league and 32-7 overall. #Badgers Happ had ice on right hand in post-game. "The right hand is fine," he said. "Thank you for asking." ???? #Badgers Showalter with another three-pointer at a critical time tonight. So confident in his jumper. Illini came in at 75.5 points per game. Held to 43 vs. #Badgers . HC Greg Gard said Wisconsin was terrific defensively "maybe as well as we've played defensively in terms of what he did in the half court."